Late last month I posted a link to an episode of “Rough Riders,” an old Western TV series that ended its two-season run in 1959. That year saw the high-water mark for the genre, when more than thirty oaters found prime-time homes on the three television networks. “Rough Riders” doesn’t make the official list since it was a syndicated product, which were sometimes marked by lower production values and were distributed to local TV stations. Dave Lovewell gave the episode a thumbs-up, and it really isn’t half bad. It's fun to see reliable character actors Peter Whitney and Jan Merlin landing featured roles in a series, even if the appearance of that poor-man's leading man Kent Taylor reminds us that the talent pool for Western thespians must have been nearly mopped dry by those three-dozen network shows and other syndicated series. Allison Hayes (“Attack of the 50 Foot Woman") makes a touchingly spunky heroine, while Lon Chaney, Jr., would give a cigar-store Indian a close contest for wooden acting. Both Hayes and Chaney turn out to have life stories that were often more interesting than what’s happening onscreen. 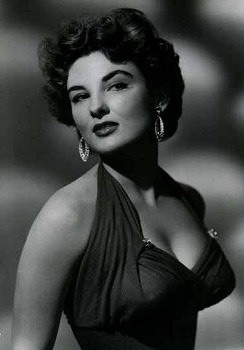 Her doctor prescribed calcium supplements after Allison Hayes broke a few ribs during the filming of “Sign of the Pagan,” and then broke an arm tumbling from a horse in “Gunslinger.” When she developed severe neurological problems, Hayes sent the supplements to a toxicologist who discovered that besides calcium they contained massive doses of lead. She died at 47 of leukemia, probably caused by lead poisoning. The self-poisoning of her fellow guest-star in “Rough Riders” was of the common variety. Because Lon Chaney, Jr., donated his body to science, his liver and lungs could be preserved to illustrate the ravages caused by consuming epic quantities of alcohol and cigarettes. The main drawback I sensed in “Rough Riders” was the title. An announcer evidently stole a few moments from every episode to explain that the three continuing characters were not the Rough Riders audiences may have expected to see, the volunteer cavalry Teddy Roosevelt led up the slopes of San Juan Hill, or even Buffalo Bill’s Congress of Rough Riders, but instead an earlier group of adventurers who made a name for themselves. It seemed to me that if you have to explain the title of your series in every episode, you have picked a really unfortunate title. On the other hand the creators of “Rough Riders” may have intended for the name of the series to be their gimmick. Every Western in those days was required to have at least one. Having more was better. The Lone Ranger wore a mask and peppered the West with silver bullets. Wyatt Earp tamed cowtowns with a long-barreled Colt revolver that must have been hell to get out of a holster faster than the other guy could draw his. 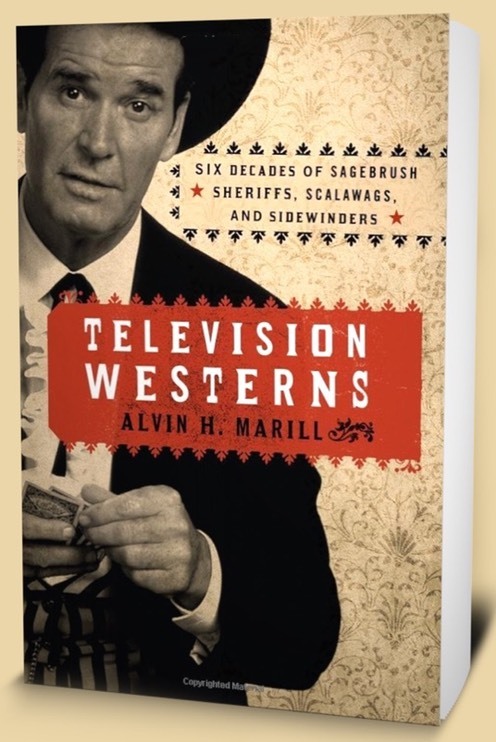 Bat Masterson was overdressed for most occasions and carried a walking stick topped by a polished brass knob. “The Rebel’s” Johnny Yuma wore a Confederate kepi and wielded a sawed-off double-barreled shotgun. Steve McQueen’s bounty hunter in “Wanted: Dead or Alive” also preferred a whittled-down weapon, a holstered rifle known as a Mare’s Leg. Chuck Connors' “Rifleman” stuck with the full-sized model, which was hardly enough to set his series apart from the pack. So, in a televised West largely populated by itinerant loners, Connors played a rancher and single parent who was raising a son. The creators of “Bonanza” saw “The Rifleman’s" widower and his one motherless son and tripled the stakes with a thrice-married Ben Cartwright and three motherless sons. Even then television writers seemed dubious about the success of “Bonanza” in such a crowded field. Not enough gimmicks, was the standard verdict. The one Western with more trademarked flourishes than even “The Lone Ranger” was “Have Gun - Will Travel,” which ran for six seasons on CBS beginning in 1957. The man called Paladin (Richard Boone) is a gunfighter for hire, a businessman whose calling card is imprinted with the image of a chess knight and the inscription, “Have Gun Will Travel, Wire Paladin San Francisco.” When he’s socializing on his home turf in San Francisco, Paladin's wardrobe would have made Bat Masterson swoon. He recites poetry, plays piano, judges wines, and savors few joys more rapturous than a night at the opera. On assignment as a knight-errant, he’s all business, donning black trail garb, strapping on a black gunbelt, snapping a double-barreled Remington derringer into the space behind his silver belt buckle, and sallying forth to right wrongs and slay varlets. A small problem with all those trademarked flourishes was that someone else claimed to own the trademark. Rodeo rider Victor DeCosta sued, testifying that he had been billed as “The Paladin” since 1947, that he dressed in black during his act, carried a derringer, and handed out calling cards containing the image of a chess piece and the phrase “Have Gun - Will Travel.” To make matters worse, DeCosta actually looked a bit like actor Richard Boone. Victor DeCosta finally prevailed against Viacom in 1991, receiving a judgment of $3 million. Unfortunately, he did not live long enough to see the money. The most that stemmed from the case was that syndication of “Have Gun - Will Travel” was put on hold for a while. When I first read about the DeCosta suit several decades back, it seemed an open-and-shut case. I’ve had a change of heart since then. Can wearing a particular color, or a lack thereof, really be trademarked? The image of a chess piece must be one of the most familiar icons ever to appear on a business card. “Paladin” is a word originally signifying one of the twelve peers of the court of Charles the Great of France, more commonly known as Charlemagne. It has come to mean any knight-errant or quest knight. The phrase “Have Tux, Will Travel,” was commonplace in the Services Offered section of newspaper want ads fifty years before DeCosta did his riff on it. There is such a thing as coincidence, as the creators of “Have Gun - Will Travel” must have understood all too well.